Our objective is to determine the utility of noncontrast Hounsfield unit values, Hounsfield unit values corrected for the patient’s hematocrit, and venoarterial Hounsfield unit difference measurements in the identification of intracranial venous thrombosis on noncontrast head computed tomography. 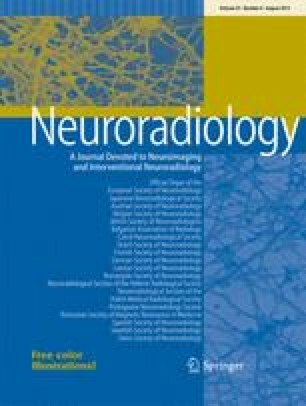 We retrospectively reviewed noncontrast head computed tomography exams performed in both normal patients and those with cerebral venous thrombosis, acquiring Hounsfield unit values in normal and thrombosed cerebral venous structures. Also, we acquired Hounsfield unit values in the internal carotid artery for comparison to thrombosed and nonthrombosed venous structures and compared the venous Hounsfield unit values to the patient’s hematocrit. A significant difference is identified between Hounsfield unit values in thrombosed and nonthrombosed venous structures. Applying Hounsfield unit threshold values of greater than 65, a Hounsfield unit to hematocrit ratio of greater than 1.7, and venoarterial difference values greater than 15 alone and in combination, the majority of cases of venous thrombosis are identifiable on noncontrast head computed tomography. Absolute Hounsfield unit values, Hounsfield unit to hematocrit ratios, and venoarterial Hounsfield unit value differences are a useful adjunct in noncontrast head computed tomographic evaluation of cerebral venous thrombosis. The views expressed in this presentation are those of the author and do not necessarily reflect the official policy or position of the Department of the Navy, Department of Defense, or the United States government. I am a military service member. This work was prepared as part of my official duties. Title 17, USC, §105 provides that 'Copyright protection under this title is not available for any work of the U.S.Government.' Title 17, USC, §101 defines a U.S. Government work as a work prepared by a military service member or employee of the U.S. Government as part of that person's official duties.